A sixty-nine-year-old woman is discharged from Southern Maryland Hospital after a stroke. She is sent to Crescent Cities Center, a Genesis subsidiary, in Oxon Hill for physical and occupational therapy. At the time, she has good rehabilitation potential, and her prognosis is favorable. Because she is obese, has dementia, and is relatively immobile, she is clearly at risk for developing bed sores. Crescent Cities Center fails to take the proper precautions to prevent pressure ulcers from forming on the woman's body. Approximately ten months into her stay, Crescent Cities Center documents that the woman has contracted new, large wounds covering her sacrum, buttocks, and thigh. Crescent Cities Center notes that these wounds could only have been contracted during her time at its facility. What is the Value of a Bed Sore Claim? Three months later, Crescent Cities orders hospice care without even consulting the woman's two sons. Two weeks later, one of her sons sees the state she is in and calls 911. She is taken to Washington Adventist Hospital. The doctors diagnose her with a Stage IV sacral pressure ulcer. Stage IV is the most advanced stage of a bed sore and can be fatal. Underscoring just how much this woman has deteriorated, she now weighs seventy pounds less than she did at the time of her admission to Crescent Cities Center. A week later, the woman is transferred from Washington Adventist Hospital to Georgetown University Hospital. Three days later, she is transferred to Patuxent River Health and Rehabilitation Center where she remains until her death. (1) failing to properly assess the woman's condition, (2) failing to design, implement, and continually evaluate/modify an appropriate care plan for the woman, (3) failing to provide necessary care and services to ensure that the woman maintained highest practicable physical, mental, and psychosocial well-being, (4) failing to ensure that the woman did not develop pressure ulcers unless clinically unavoidable, and (5) failing to provide necessary treatment and services to promote healing of existing wounds, prevent infection, and prevent new sores from developing. The sons contend that Genesis' negligence resulted in (1) their mother's injuries including severe pressure ulcers, weight loss, malnutrition, dehydration, and infection, (2) pecuniary losses she incurred in the form of medical expenses, and (3) her eventual death. Parenthetically, this was the first medical malpractice lawsuit filed in Maryland in 2016. Provide necessary treatment and services to promote healing of existing wounds, prevent infection and prevent new sores from developing. Eleanore E. Tache, RN, LNHA, CDON: a registered nurse with 30 years of experience; certification from the National Association Directors of Nursing Administration for long-term care; serves as Director of Nursing for the Meadow Park Rehabilitation & Health Care Center in Flushing, New York. Mario Cornacchione, DO, CMD, FAAFP: licensed physician board certified in geriatric medicine by the American Board of Family Practice and long-term care by the American Medical Directors Association based in Scranton, Pennsylvania; a significant portion of her practice is devoted to geriatric care. Another example 2016 bed sore lawsuit, this one against a hospital (MedStar). Genesis is a frequent flyer defendant in Maryland. This is another lawsuit filed in Montgomery County against a Genesis facility that involved a fall that led to a fractured neck. What does it mean to be granulating? Often, the defense in bed sore cases is that the patient had a Kennedy terminal ulcer which, if the facts support it, can be a formidable hill for plaintiffs' lawyers to climb. But typically the defense has little facts to support this rare event. 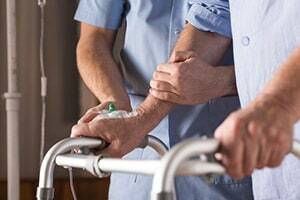 What is the value of a Maryland nursing home wrongful death claim?